Update from October 4, 2017 YAY!!! You Are Here Epcot 3 is finally here. The latest version of Epcot mugs was just spotted on the shelves in respective theme park! From what I can see, the initial collectors’ reaction has been all positive. 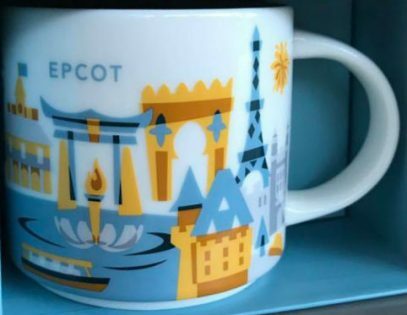 Indeed new mug is pleasantly looking and is completely different from Epcot 2 (and Epcot 1 as well). The monorail is gone, at least from the front of the mug. I am going to wait for more pics to confirm that. Again, my advice is to get V2 if you still don’t have it, because it will become HTF pretty soon. Disney mugs keep appearing like they’re coming from cornucopia (horn of plenty). This weekend’s release – You Are Here Disney – Epcot. Yes, V3! This is the second Disney YAH with third version (see Hollywood Studios mugs). As per official announcement on October 1, during celebrations of Epcot’s 35th anniversary, there will be special merchandise offered. Among those, obviously, Starbucks Mug. I don’t have the picture yet, but as soon as I get it, I will update this post! Again, as usual, my advice is to buy previous version as it will become more expensive for sure. Update from October 3, 2017: it took me some time, really, to get over the fact, that it was not the Epcot YAH released on October 1. Instead, Starbucks revealed some retro style commemorative mug, see this post. I am still positive Epcot 3 is coming anytime soon. Stay tuned!